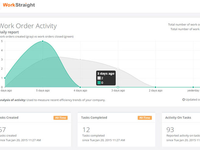 WorkStraight was designed to be industry neutral and is used by businesses ranging from single person startups to companies with hundreds of employees across a wide range of industries. 30 day free trial and no credit card required. 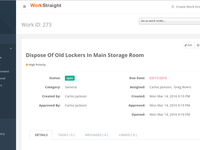 Use WorkStraight to securely create, receive, and track work requests from your team, customers, or outside contractors. Assign work to multiple users, require approval, receive notifications, print work orders, download report data, integrate QuickBooks, create invoices, manage customers, and much more. Pros: Very happy with workstraight - easy to use and customise and price very affordable for our small business - used for a small print company to keep track of client orders and works very well for us having taken over from a paper based system which mean forms were being passed between office and workshop - workstraight means we can all access the orders and update them accordingly when needed - even out of the office. Cons: Would love more features - would maybe even be willing to pay a bit more for a some if they worked for us. Ability to mass save PDF copies of work orders and then mass delete would be ideal for archiving. Also a few customisable statuses would be great - as closed and open don't always fit our needs - a completed status to go in between open and closed would be amazing! Reporting is slightly limited - a report which lists all open orders and can be run by assigned staff member or all would be great. So more features would really be on my wish list to ensure we don't ever grow out of the software. Overall: As I said. We are a small print company so use it to track orders for customers - not I think what the system was built for but we make it work for us and it's much better than some of the more specific/complicated/pricey systems out there for print shops to use. If you could please send us an email with more of your feedback would be great, we would be really happy to add it to our feature request list, so we can try to implement it in the near future. Again, thanks for your feedback and your review. We truly appreciate your support through these years! Pros: This software is so easy to use. It has streamlined our work order process with minimal intrusion into other daily tasks. Keeping up with maintenance issues and tracking when items are completed is now a snap. We are a small organization and cannot afford many of the other software programs on the market. This has been a game-changer for us. Cons: We had an issue a while back with the program going offline with no way to get in touch with support. Hopefully, that has been resolved now. Everything is currently working great. 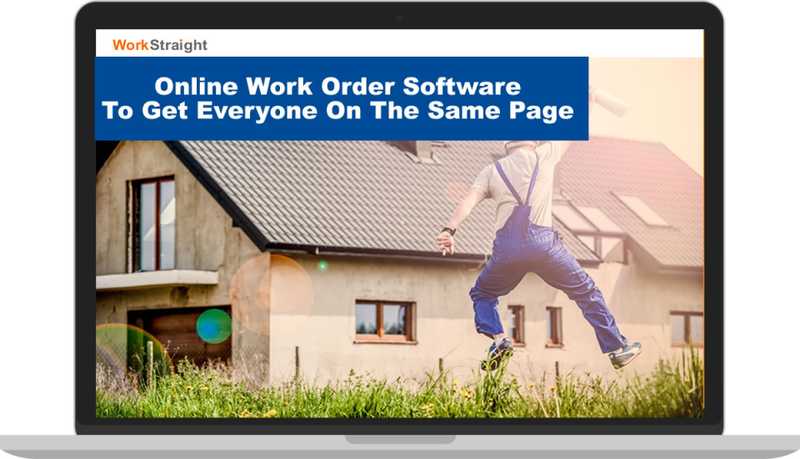 Overall: WorkStraight has eliminated our need for lengthy maintenance meetings and constant emails about issues. The work orders are sent directly to the maintenance supervisor on his phone and tracked through the online portal which he updates daily. Maintenance is much more organized, and the administrative office staff is much more efficient now that they don't have to try and 'track down' maintenance. 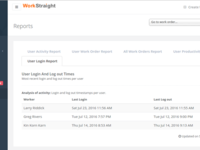 We're very happy with WorkStraight. We are sorry that you experienced a problem with our customer service. We are working really hard, so that does not happen anymore. We are very happy that WorkStraightbeen a game-changer for you! If you have any question or concern, please do not hesitate on reaching out, we are here to help! Pros: This software allows all of our locations to communicate on needed repairs. It helps our maintenance team stay organized. Cons: There isn't a mobile app. You can do it from your phone but it's much easier to make entries from a computer. Overall: We are eliminating communication breakdowns using this software. It keeps all of our maintenance issues organized and in one place. Our experience has been positive. We are very glad that your experience with WorkStraight has been positive. Besides the app, is there any other thing that you would like us to improve? Your feedback help us to provide a better service! With regards to the mobile app, we are working really hard, and we are hoping to launch it this year. Pros: It is easy to use both in an office setting on a desktop/laptop and in the field on a smartphone or tablet. Cons: I cannot include our company's logo on invoices that I submit to our customers. Overall: We provide commercial property management and WorkStraight works great for our work orders. When a tenant needs lights changed or toilets unplugged, we use the program to assign the work to one of our maintenance providers and the work order goes directly to their phone, which is great! We are very happy that you are liking WorkStraight, and that you and your team find it easy to use. We like a lot your idea of putting your company's logo on the invoice, we will work and try to implement it in the near future. If you have any other question or idea, please feel free to reach out to us by email or phone. Works okay. Website can be extremely slow. Cons: Website can be clunky and slow at times. I wish that I could open it up directly onto the open work order page. All joking aside, we truly appreciate your feedback. Helped us to review areas that needed work, and everything should be working fine right now. Thank you very much, and please let us know if there is any way how we can help you! Great program...everything I need and then some. Pros: This software is able to work for not only my maintenance crews, but other departments as well. I love the ability to assign work orders back and forth to all employees and the prioritization function is a great bonus. Cons: The only thing I would change is the ability to delete a ticket. I wish only my administrator account would allow this just to keep everyone honest. I have had employees blame each other in the past and I never knew if someone deleted a ticket or if someone else failed to even create it. Overall: We use this software to issue work orders to our public works department for sewer, street, and water system repairs. We have been able to set up our Police Chief and City Clerk as additional users as well and have been sending out "extra-patrol" requests to the officers. This is Rafael from WorkStraight Support! We want to thank you for your review. We are glad that WorkStraight has lived up to your expectations and has worked well for you and your team! You can change the different access level you give to your users, and choose if they only have access to the work orders you assign to them. But we will take a better look into it and try to implement some filters for the future. We truly appreciate your kind words and your support! Please feel free to give us a call to (510) 990-1030 if you have any question. Pros: The software was simple to learn, train staff, and use. It has allowed us to track our team and prioritize jobs. Cons: For our usage, we have to click through more screens than we would like. We are happy that you and your team are happy with the software! Your support through this years is greatly appreciated. We will try to see how can we limited the clicks through different screens. Thanks again, and please feel free to give us a call to (510) 990-1030 if there is any way we can help you. Pros: Ease of use, web based interface, configurable user access, access from anywhere and on mobile tablets. Cons: Would like a bit more granular customization of work order form, ability to sort work orders by client/employee name or employee ID. Overall: A central place to manage all of our workorders. We use it to manage our workflow from client request to invoicing. A great way to keep records of service calls and what was done. Very happy with the service offering as a whole. We are very happy that you are liking WorkStraight. What kind of customization would you like to see? We will be really glad to hear your thoughts! Pros: Very affordable, super easy to use. Helps our department keep on top of work orders and tasks. Cons: I truly cannot think of any Cons. The product works great! Overall: We are now able to stay on top of tasks and prioritize our work schedules. The product is less than 1/2 of the cost of similar products and so easy to use! Sarah, thank you for your review!. We greatly appreciate your support! If you have any feedback or suggestions, please feel free to send us an email to support@workstraight.com or give us a call to (510) 990-1030. Pros: Ease of Use, very affordable, able to do some customizing. Cons: Would like there to be more customization and less restrictions on the characters you can use in custom fields. We would love to hear what kind of customization you would like to see in WorkStraight; thank you very much for your feedback. Feel free to give us a call to (510) 990-1030 or send us an email to support@workstraight.com. We are glad that you are enjoying WorkStraight! Pros: Internet Based Program that is overall versatile to form to your business needs. Cons: Search Options for finding Open Work Orders as well as having to scroll thru all customers in order to assign to a certain one rather than being able to type part of the name to limit results to assign easier. Thank you very much for your review, is greatly appreciated! We are very happy that you are finding WorkStraight useful for you and your company. We would love to hear more about your feedback, if you can send us an email to support@workstraight.com would be extremely helpful. Your feedback help us to make the software better. Pros: The software is intuitive to setup and use. The online work order submission form has allowed us to easily collect requests from staff at multiple sites, which leads to quicker fixes and happier employees. The user interface is laid out well, making both daily use and customization simple. Cons: While the mobile layout of the website works, it would be nice to have an app for staff who work throughout our campuses. Overall: We were receiving requests from multiple sources (email, white board, conversations, etc. ), which led to requests being forgotten or missed. Now we have all request in one place. The online form also insures we have all the information needed to get to work right away. Thank you for leaving a review! We are very happy that you are liking WorkStraight. We are working really hard on the mobile app, we will let you know once we have a release date. Again thank you! Please do not hesitate on reaching out to the Support Team with any questions or concerns. Overall: We are a large Catholic parish with five properties. 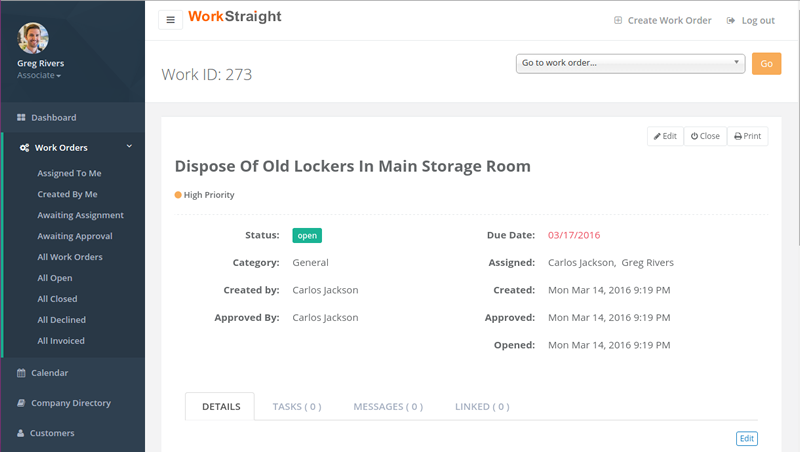 We use WorkStraight to manage our work order system. We went from managing the maintenance items from paper to using this online system. We've been very pleased with the ease of use and modest cost. Recommendations to other buyers: Try it, you'll like it. Glad you are pleased with the software! FYI, there was a software update earlier this year. Now, each file upload can be up to 10MB in size. Hope this helps! Pros: While we probably don't use the software to its full potential, it is still a good tool for us. Our favorite part is the basic structure. It is easy to see a snapshot of open work orders, closed, pending, etc. We also like the ability for the employees to start work orders and then to be approved later. Cons: We are really hoping a mobile IOS app will come out soon. Alot of the time we are on site and it is a little slower to use the safari version. Overall: We get a far more organized team, and an easier time when it comes to billing. We are working really hard on the mobile app (IOS and Android). Our goal is to release it next year. I'll be happy to reach out to you once is up and running! In the meanwhile, your support is very much appreciated! Overall: Everyone thinks it is very easy to use and simple to put in work orders. The support is also very good. Anytime I needed something I recieved a response is reasonable amount of time. I hope they continue to improve the software. Thank you very much for your kind words! Your support means a lot to us. Please feel free to give us a call with any question or suggestion! Have been trying to contact the company for a month now and no one responds. Works good as a communication tool between staff members and maintenance staff. Extremely poor customer service. Actually no customer service. Cons: They need to organize items better. Need to make less steps. Once a WO is closed it should drop off the main list. Extremely poor customer service, no response. 14 emails (including portal). Tried calling but the number goes to a fax line. NO CUSTOMER SERVICE. no one responds to calls and issues. I would like to start apologizing for not answering your previous requests. We had some issues with our ticketing and customer service system, but we have fixed it! Sorry that it took us a long time, however, our customer service is up and running! We have some improvement in our reports, and in some different areas coming up in our next release. If you can give us a call to (510) 990-1030, we would like to make things right for you! Thank you for your review, it helps us to make WorkStraight better. Hopefully, you can give us a second chance. It is has been a great experience based on cost of the software. Pros: I like the notification system the best. When a ticket is entered or changed a notification is sent to everyone that is assigned to the ticket. Cons: I would like to be able to sort by field type. We have technology tickets and maintenance tickets. I cannot separate the two types of tickets when reporting. The reports need to be detailed by type rather than by a CSV dump. Overall: We are able to keep up with all requests in one central location. With regards to separating the tickets, you can use one of the customizable fields creating a dropdown list, so you can sort the tickets you receive. Or you can also use the "Category Field". Yes, our report area needs improvement, so we appreciate your feedback! We promise we will work hard to make it better. Please do not hesitate to reach out with more ideas or some questions. Helps a lot with streamlining our office's work process. Pros: Pleasant, intuitive interface, fairly customizable, reasonably priced, quick response from customer service dept. Overall: Increased workplace efficiency and organization. Hazel, thank you SO much for your feedback! I think we have made some progress since you entered your review, but there is still plenty of room for improvement. Your support is very much appreciated as well as your suggestions! WorkStraight has been a big help! Pros: This software has really helped streamline our rental maintenance workflow. We can all look and see where in the process a repair is. And it helps with billing too. Cons: The lack of a mobile app. Please add that in the near future! Overall: We are a property management company. We have to keep track of repairs and work orders for our tenants and owners. Your review is very much appreciated! We are very happy that WorkStraight has helped you and your company. About the app, we are working on the development, we hope that this year we can launch it! Again, thank you Sarah. If you have any question or concern, please do not hesitate on reaching out to support@workstraight.com or give us a call to (510) 990-1030. Cons: Would like to be able to email to multiple emails, we get around this by setting up email groups. would also like to assign someone to more than one group. Overall: Very easy to use, Would like to be able to export the information by a date range. Recommendations to other buyers: keep working on it, very good. Feel free to contact support with any questions and thanks again. Pros: I like the ease of use and the customization the most. The price was great as other solutions offered functionality I didn't need and a much heftier price tag. Cons: The only issue I've had thus far is that i'd like to make some fields not required as they don't apply to my team's work. Otherwise, I may just have a learning curve with the software as I've only been using it for a month. We truly appreciate your review! 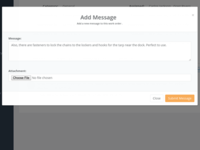 We are trying to make the work order more customizable and easy to use. But, we are very glad that you are happy with the software overall! Cons: Outside access URL not customizable and is extremely long and hard to disseminate. Not all fields on forms can be changed and end up just being wasted space. We appreciate your review, Greg! We will take a look into the outside access area, and see how we can improve it. Thanks for your feedback. It helps us to provide you a better service! Do not hesitate to reach out to us with more suggestions or questions. Needed something fast and relatively easy... WorkStraight fit the bill. Pros: Accessibility via the Apps function in Google, relative ease of use, ease of adding users, Clear Graphic representations of Work Orders on home page is a big plus- quick snap shot of status. Overall: Quick & easy onboarding, and next day operability. We truly appreciate your review! We are very glad that you are happy with WorkStraight! We will make sure to take note of your feedback. We will try to explain better the different 'minor features' that WorkStraight has so customers can understand all the things you can accomplish with the software! 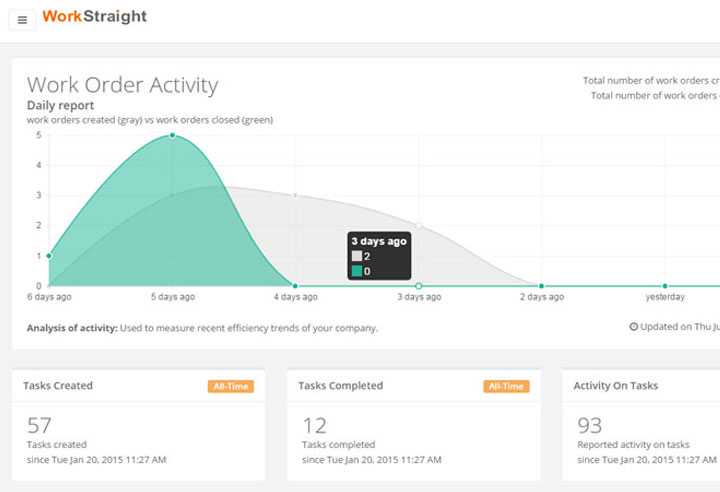 Pros: WorkStraight offers an platform that streamlines work orders for a variety of things. It is simple to use and update as needed. Cons: While WorkStraight is easy to use, there are a lot of limits (at least at the price point I have access too) to the type of questions/forms that are available. Also, there are parts of the system that are less userfriendly than I would like. Overall: We are using WorkStraight to manage internal grant opportunities and assign work on each grant. So far it has worked well. We are just beginning to implement this process. What parts have you found less user friendly than the rest? And also, what limitations have you found? We would be glad to hear your feedback, so we can improve WorkStraight. Hopefully you can give us a call to (510) 990-1030 or send us an email to support@workstraight.com! Pros: I use this to keep track of our service order requests. It is very easy to use and you can customize the entry forms to suit your specific needs. Cons: I can see that if I leaned on this software more it would be limited in overall capability. It's pretty generic but as I said in the pros, I am simply using it as a database for simple service requests. Is there something that you would like to see improved? Your feedback help us to improve our service. If you have any suggestion, please feel free to send you an email to support@workstraight.com or give us a call to (510) 990-1030. Have had a good experience so far. Pros: Easy to use for everyone involved. Simplistic and easy to follow forms for submitting work requests. Thank you very much for leaving a review. Your review helps us to keep growing, and help us giving our customer the best possible service! Please let us know if there is any way how we can help you with, feel free to give us a call to (510) 990-1030. 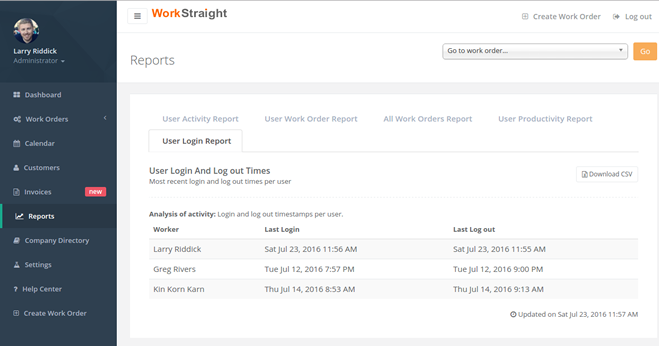 WorkStraight was a good product but did not have all of the features we needed. Pros: The ease of use, the customer support, and the free trial were very useful. The price point, as it is not per user, was competitive and attractive. Cons: Our needs are very specific for this product. We are going to be using laptops and cell phones for our forms, so being browser based only was very restrictive for us and will not provide us with the service we need. Overall: Insight into the options available as well as what software functionality I would enjoy in a paperless environment. We are sorry that we couldn't provide the service you needed. We hope to release our mobile app next year! If you would like, I'll be happy to send you an email when our app is ready! Please let us know if there is any way how we can help you. Pros: It's great that I can clearly move projects from other software to WorkStraight. I love being able to view everything in one place. Your feedback helps us to keep growing. We truly appreciate your support over the years. Thanks for your review, and for your feedback! With regards to the notification option, you can add it on your calendar a set a reminder. The reminder will pop up in the app. If you identify any other thing that could improve please feel free to send us an email to workstraight@support.com or give us a call to (510) 990-1030. Pros: Application is easy to use. Custom field naming allows user to feel comfortable using their terminology. Cons: Dashboard only referencing tasks does nothing for people who don't use tasks. Would be nice to use for something else. Thanks for your feedback with regards to the Dashboard. We will try to make it more customizable and useful! As well, we renovate our customer service system, so you will always have help and support with any question or issue you might have. We are sorry if that caused any inconvenience. Thanks for your support! Please do not hesitate on reaching out to us with any other suggestion. Pros: A perfect value of the investment,quite easy workorder creation , Submission and closing .The external submission option is great . Cons: Customization options are very limited , as well the option to modify existing table not available. as well the Print format is lengthy. 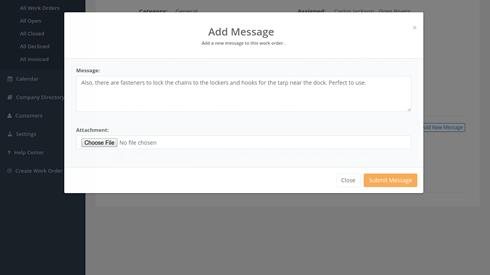 We have worked on making our work orders very customizable and user-friendly! Your review is very much appreciated, it helps us to provide a better service. Please let us know if we can help you in any way! Pros: Easy to use for basic daily work order function. Clean interface with strait and to the point reporting. Great features for interaction with clients who submit work orders. Edward, thanks for your feedback about the customization. We will take a look and try to improve the form layout! It's on our feature request list. Thanks for your support over the years. It's very much appreciated! We decided to go with a different company, but this was our second favorite. Pros: I liked the user-friendly functionality of the software. It was very easy to figure out and very intuitive. Cons: My technicians did not enjoy the app portion. The android app left much to be desired, that is once we were actually able to log on. Sorry to hear that you had to go in another direction. We appreciate your honesty. If you decide to give us a second chance we will make sure to make things right for you!